BackupEDGE 3.x supports performing multiple backups onto Blu-ray Disc BD-RE and DVD-RAM media. Writing a backup to a either of these medium will now result in BackupEDGE adding the new archive using free space rather than simply over-writing the medium from the beginning. Other optical medium do not support multiple backups at this time. Please note that backups on optical media by BackupEDGE 3.x are only readable by BackupEDGE if multiple backups per medium are enabled (which they are by default). A restore will not be possible without using a 3.x version of BackupEDGE. On optical media, expired backups are reclaimed lazily (like FTP/AWS/FSP) rather than aggressively (like TAPE). BackupEDGE defaults to filling up the medium before reclaiming anything. It may not start at the front of the medium, or go in any sort of predictable order. 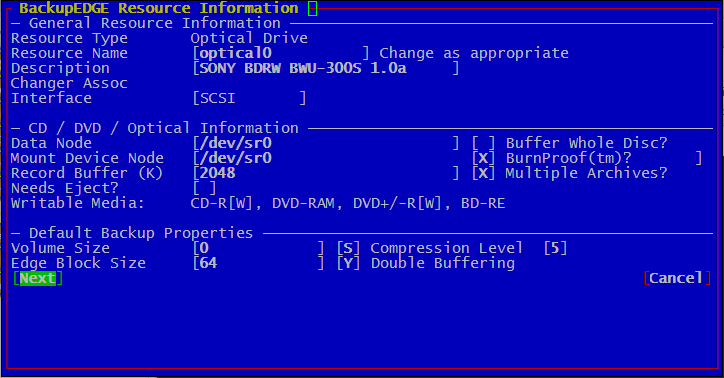 In fact it may purposely avoid the earliest parts of the disc to save room for a boot track to be written later. BackupEDGE uses a wear-leveling algorithm to get more use out of the media, since some Blu-ray and DVD media wears out faster than others if re-written frequently. It does not attempt bad sector reclamation, so if a write failure happens you should replace the medium. Disaster recovery will prompt you to select which backup you want to restore from if there is more than a single backup on the medium. Using a disc to with multiple backups to make bootable media will function as it did in the last edition of BackupEDGE. However setting a scheduled backup to make this bootable will create a warning after the first backup. This warning will exist until the time to live of the first backup expires and the boot section of the disc can be over written, which will then start causing warnings again.